Angel Sun Catcher is rated 4.8 out of 5 by 27. 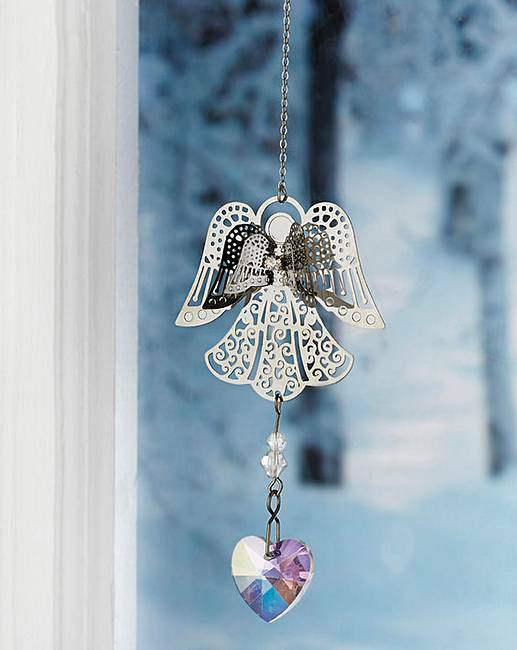 Stunning angel sun catcher, which reflects light into rainbows through the beaded heart pendant when hung by the window. Rated 5 out of 5 by Jinny from beautiful I bought the first one for myself and thought it was that good i got for my friend. Rated 5 out of 5 by louie 3 from Favourite item i bought one of these some time ago and loved it but unfortunately i shut the window too quick and the crystal broke i was upset so when i saw them on line again i just had to get another one lovely purchase would recommend this to any angel collector. Rated 5 out of 5 by Dons8 from Just beautiful Bought this for my dad and loved it do much i purchased one for myself! Rated 5 out of 5 by Tilly64 from Love this absolutely beautiful Beautiful crystal, inward so pleased with this I bought two. Rated 5 out of 5 by Lubu from Really pretty Bought two as gifts. One ended up in Argentina! Very delicate and comes nicely packaged. Will definitely buy again.